The European airline industry has seen the future of aviation. It’s sleek and organic, carries a sextet of turbines, and its powertrain works a lot like the Chevrolet Volt. The European aerospace consortium EADS has recently shown everything from its largest airliner, the Airbus A380, to its latest electric airplane idea, the E-Fan. But tucked inside the company’s huge chalet at the Paris Air Show was a small model where the two concepts meet — in 2050. The E-Thrust project is part of the EADS Innovation Works program, a partnership with engine maker Rolls-Royce. The two companies are looking at ways to meet the European Commission’s future vision of air travel, which includes dramatic reductions in emissions and noise. 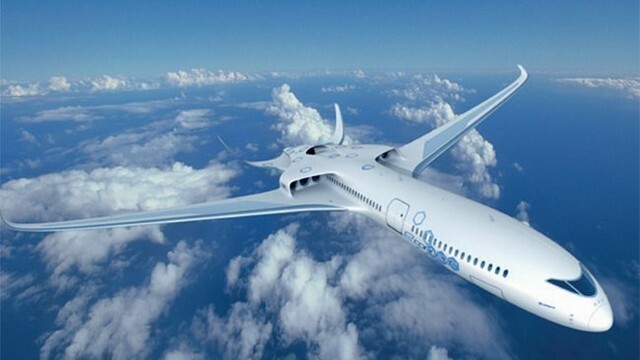 Like the NASA turboelectric distributed propulsion research project (TeDP), the EADS distributed electrical aerospace propulsion project (DEAP) uses a serial electric hybrid system to power the airliner of the future (AotF… just kidding). Electric airplanes like the E-Fan, the long range Solar Impulse, or Chip Yates’ electrified Long-EZ all point to an ending where either range, speed or payload (often all three) are sacrificed for the ability to fly on pure electric power. The idea behind the E-Thrust is to use several electrically driven fans to provide the thrust, but the power supply will be a gas-turbine engine employed during cruising when it just needs enough juice to stay in the air. When it needs more power — during takeoff and climbing — an “energy storage system,” (aka batteries) will provide an additional source of grunt for the fans. 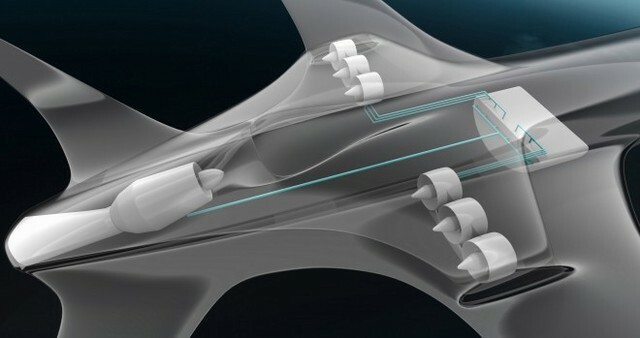 As a starting point, the EADS concept has two banks of three electric fans tucked into the wing roots of the airplane. Because they can be much smaller than the fan-jet engines of today, they don’t have to hang from the wing, and are instead placed where they create less drag, and can also re-energize the air out the back reducing drag from the airplane’s turbulent wake. A single turbine engine in the tail ingests boundary layer air from the top of the fuselage in an effort to further reduce overall drag. In many ways the E-Thrust concept is an electric deconstruction of current jet engine technology. Unlike the early days of jet aircraft, today’s airliners only get a fraction of their push from jet thrust. Most of the propulsion is provided by the giant fan at the front of the engine, which accelerates air just like a propeller. These high bypass ratio fans are powered by the jets, and there’s no reason they couldn’t be powered by electricity instead. But since batteries are impractical in their current form as the sole energy source, you need an alternative supply to provide the majority of the power. So like Chevrolet has done with the Volt, EADS will use a relatively small jet engine as a generator to power the fans and charge up the batteries during cruise. With power reduced during the descent, the windmilling electric fans could recharge the batteries on the airplane, providing a small amount of regenerative energy — or in car terms, “regenerative braking” similar to how hybrid-electric cars recoup energy when braking. The fact that the E-Thrust on display in Paris was simply a plastic display on a podium is a clear indication that it’s still a long way from taking to the skies. Both the DEAP system from EADS and NASA’s TeDP rely heavily on superconducting motors to provide the electrical power needed for flight, without the massive amounts of heat that would be generated by standard electric motors. We don’t expect to see an E-Thrust airliner — or a TeDP plane from Boeing — anytime soon. But both ideas show promise and could spawn a concept that isn’t destined to vaporplane limbo.